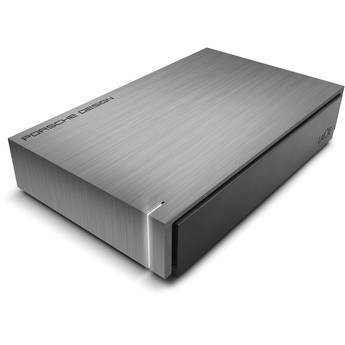 The Porsche Design P'9230 4TB USB 3.0 Desktop Hard Drive from LaCieprovides enhanced performance in a 5mm aluminum casing. This durable hard drive makes it possible to store a large number of HD quality videos, movies, photos, and other files. Transfer these files quickly and efficiently via the USB 3.0 port allowing for data transfer speed of up to 5Gb/s. The USB 3.0 port is also backwards compatible with USB 2.0 connectivity for data transfer speeds of up to 480Mb/s. The LaCie Porsche Design P'9230 is a desktop hard drive that takes into consideration both form and function. The P'9230 lets you transfer files faster with USB 3.0 performance, and has the capacity to hold virtually all of your files. It also features a striking LED that indicates the power status of your drive. Both Porsche and LaCie have worked closely to create products that blend functionality with pure design. With the P'9230's USB 3.0 interface, you'll be able to get the job done faster with the ability to transfer a 700MB video file in just under 7 seconds. With USB 3.0 speed, you can back up your photos, videos, and music files, and even exchange them with friends or colleagues. The P'9230 protects your files with 5mm of aluminum casing surrounding the drive inside. This solid armor protects your data, and even helps to dissipate heat. These properties help to protect the hard disk and prolong its lifespan.